Belt drives are like corduroy and Ska – they come in and out of fashion, like very 15 years or so, and this year belt-drives are back (maybe the Mighty Mighty Bosstones are planning a reunion or we can at least remember what it was like before No Doubt). A belt-drive single-speed will debut at Interbike, Ellsworth’s Signature Ride is belt-driven, and the Bicycle Design blog is pondering belt-driven design. 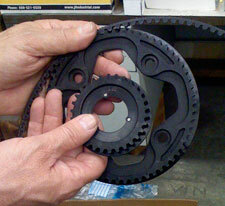 As belt-drives come and go, what do you think? For Urban Bikes, seems to make sense, unless it’s wet and they slip.